Carrie loves spending time in the outdoors with family and friends. She enjoys running, biking, skiing, hiking, paddle boarding and any other activity that involves being outside! Carrie has been working within the Old Orchard Beach School System for 7 years. She has taught special education in grades 4 -5 and currently holds the position of Instructional Strategist district wide. 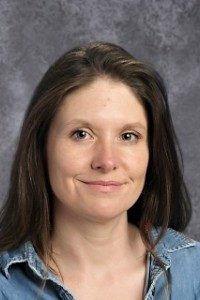 Carrie really enjoys her current position as she is able to work with students and staff throughout the district. The challenges of working with a range of students and adults continues to make work rewarding. Carrie particularly finds satisfaction in helping staff problem solve or reach a set goal. Carrie has taught held special education roles within districts in both Massachusetts and Kansas. She finds that staff who have been part of different school settings can bring a variety of new ideas in order to creatively problem solve. Carrie also worked as a Registered Nurse on a Cardiac floor for a number of years. Her passion was for patient education and she enjoyed helping patients achieve their health goals. Carrie received her undergraduate degree from Bridgewater State University. She is currently working towards a Master’s in the area of Educational Leadership.